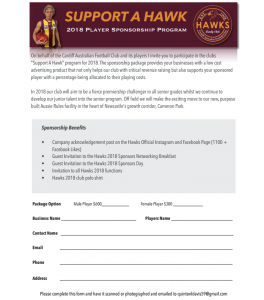 On behalf of the Cardiff Australian Football Club and its players, we invite you to participate in the clubs “Support A Hawk” program for 2019. The sponsorship package provides your businesses with a low-cost advertising product that not only helps our club with critical revenue raising but also supports your sponsored player with a percentage being allocated to their playing costs. •An Introduction to The Hawks strong corporate network.